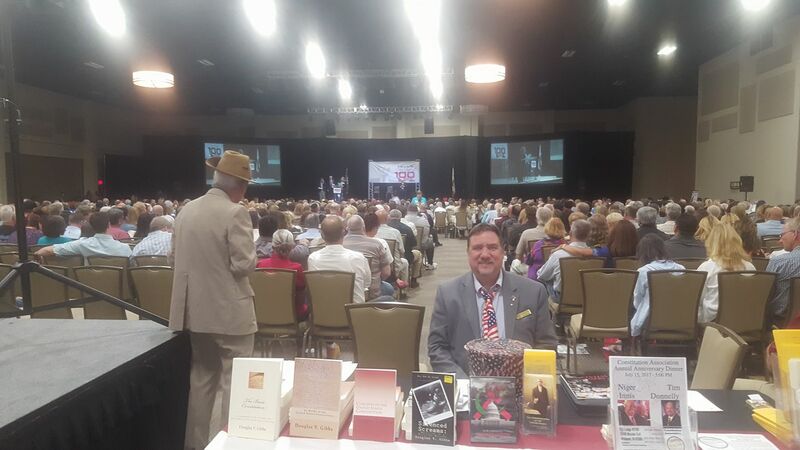 Joel Pollack of Breitbart News spoke to the crowd at the United IE Conservative Conference in Riverside, California. He talked about the importance of national security and the Trump presidency. The crowd responded well. 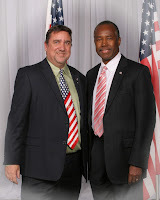 Then some of our local republicans from Sacramento spoke, like Jay Olbernolte and Mike Morrell. Great ending to a very good event. In that last one I am joined by Sherry "Ms. Ashley" Gilliam, a great historian, and speaker on the sins of the Democrat Party against Blacks in America. California Assemblyman Chad Mayes has already had me scratching my head before, when he said he supported the unconstitutional and un-American National Popular Vote movement (something that would destroy the Electoral College, and move us closer to Democracy and away from being a Republic). Now, according to the Los Angeles Times, he's also joining the Democrats on another ridiculously dangerous issue. In regards to Climate Change, Mayes says he's ready to work with Democrats by embracing the State’s complex regulations to reduce greenhouse gas emissions, while President Trump is trying to roll back unconstitutional national environmental policies. Mayes and almost all of his colleagues voted against last year’s measure to set a new, tougher target for slashing greenhouse gas emissions by 2030. But now that the goal has become law, he wants to work with Democrats on extending the cap-and-trade program, which requires companies to buy permits to release emissions into the atmosphere. Mayes is joining a Marxist attempt to control energy use and the private sector of manufacturing through made-up science, and statist mechanisms. Remember, Karl Marx's goal was for government to take control of the means of production, and cap and trade is a move in that direction. 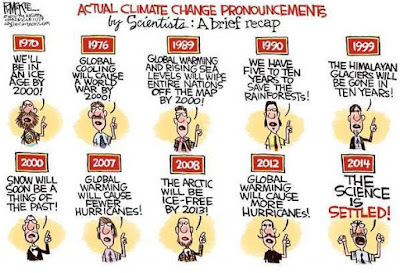 While I believe the Earth warms and cools, and it did recently go through a warming cycle, real science, and history, has shown that it is a natural phenomenon, that human influence on the issue is negligible, and that trying to control energy use through climate hysteria is nothing new when it comes to the liberal left Democrats. Remember, in the seventies, it was claims we were headed for the next ice age, and yes, unless you conformed to liberal left energy policies, the world was doomed. While we expect such lunacy from the Democrats, it is always disheartening when we see Republicans like Mayes fall for the bullcrap, as well. 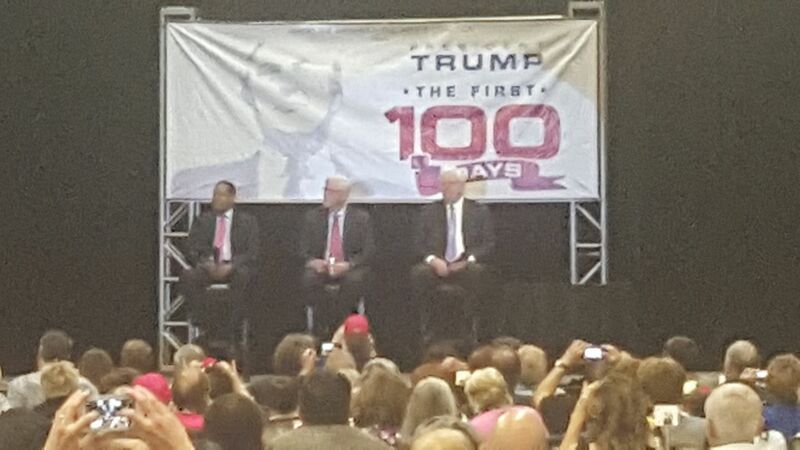 Evan Sayet, Hugh Hewitt, and Larry Elder. Dennis Prager is also among our speakers. I met him a few years ago. There are few more passionate about conservatism and Israel, than is Prager. 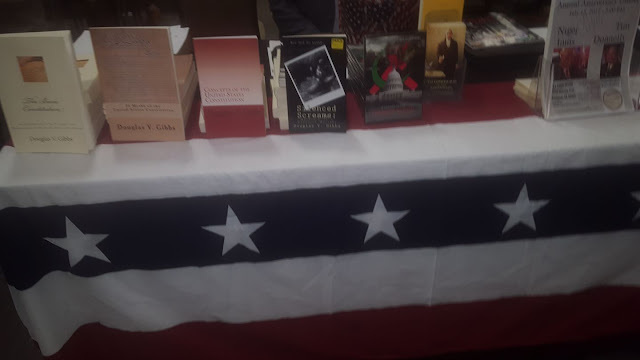 Setting up the table worked out nicely, and I've already sold a few books. While going back out to the parking lot to get my name tag, however, I noticed a long line of folks waiting to come in, and on the sidewalk, a dozen, or so, protesters. And the problem is, they want us silenced. 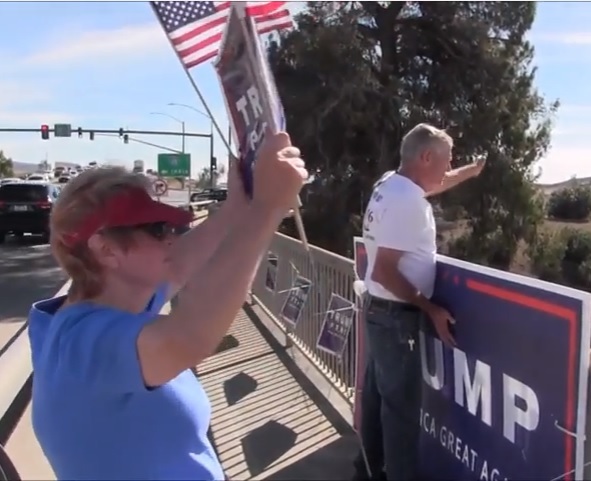 Trump is a liar, according to the protesters, and conservatives are to be reviled. I was shouted at, but didn't hear what was being said. Liberal leftism is an ideology of anger and rage. So much for their so-called tolerance. Personally, it isn't conservatives acting violently in places like Berkeley, and doing what they can to silence the opposition. It is the liberal left practicing fascist techniques to silence their opposition. Pictures of the event are forthcoming. When you give gifts from the treasury to a people, and they become dependent upon government "entitlements", the only result when the quantity of the poison being administered to the public is reduced is addiction withdrawal and violence. 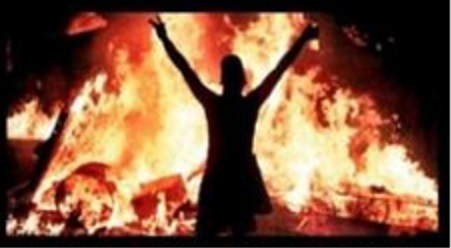 When it comes to Marxism, and other leftist ideologies, the reaction when one doesn't get their way, or a political opponent dares to declare ideals different than that of the mob, is a temper tantrum of a massively violent magnitude. The thing is, such mob violence is not only the trademark of Black Lives Matter and today's liberal leftist snowflake population. I am not talking about America's snowflakes who are whimpering and whining because as pawns they've been taught to be a bunch of crybabies by the liberal left establishment when they don't get their way, or they don't receive a participation trophy. The violence is like what we saw in Greece, when due to lack of funds, the gifts from the country's treasury was forced to be reduced. In Brazil there is more to it than just austerity, and violence. The government, like Venezuela's, has been chasing a utopian dream of socialism, and with the socialism came corruption, and with the ideology came failure. This is what happens when liberal left progressive socialist principles are followed. . . In Venezuela, faced with a collapsed system and rising authoritarian policies, even the poor who originally adored Hugo Chavez for his socialist policies, are hungry, angry, and becoming violent. 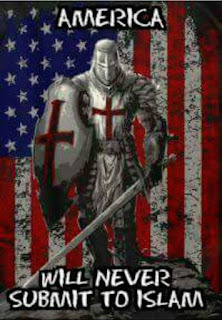 As the snowflakes worsen their assault on anyone who disagrees with them with violence and and revolutionary demands, it is becoming clearer and clearer that the heart and soul of America is at risk. How can we Make America Great Again, if the moral compass of our country is corrupt and violent? Catch the Constitution Radio with Douglas V. Gibbs radio program online at KMET 1490-AM, or the podcast later on Sound Cloud. If you missed the show, it's not too late. Listen at the podcast page! 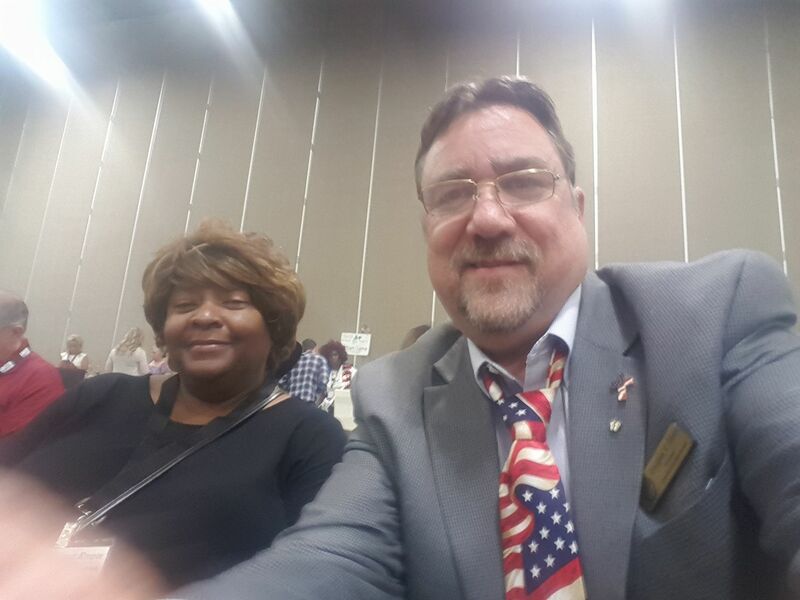 Conservative Voice Radio is Hosted by Mr. Constitution, Douglas V. Gibbs, Author, Speaker, Instructor, Radio Host and members of the Banning-Beaumont-Cherry Valley Tea Party, Glenn, Jan and Diane. The show airs on Saturdays, 8:00 am, on KMET 1490-AM. Listen on your radio dial, online at KMET, or with the KMET phone app. Mr. Constitution's Upcoming Schedule. 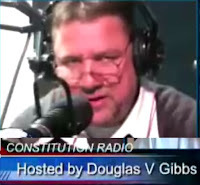 . .
Douglas V. Gibbs, Author, Speaker, Instructor, Radio Host, a.k.a. Mr. Constitution, keeps a pretty busy schedule. I would love for you to be able to join me at some of the events I am a part of. While in the next week, or so, I don't have any public speaking events (you can BOOK ME HERE), my regular schedule can be a busy one. To show you how busy I can be, and to give you a heads up on opportunities for you to join me, my schedule is below. As for the reason for doing this "upcoming schedule" post, it all began on Facebook. . .
From Day One the Democrats have been slamming Trump about how corrupt it is for Donald Trump to have his presidency surrounded by members of his family. Heck, he even hired his daughter Ivanka as an "unpaid" assistant. Among those Democrats slamming Trump for his nepotism in the presidency is Congresswoman Maxine Waters, the hard left Democrat who represents a portion of the Los Angeles area. There is this funny little thing about Maxine Waters, however. It seems that she has also used her position in government to get "her" daughter a job, and Maxine's daughter's silver spoon performs a gigantic show of revealing how much of a hypocrite Waters, like the rest of her fellow Democrat buddies, truly are. The daughter of Maxine Waters is Karen Waters. Karen has earned more than $600,000 working for Maxine’s campaign, which runs on public donations. According to Tea Party News: Karen Waters has been on the payroll of her mother’s campaign committee, Citizens for Waters, since 2006. Karen oversees a gravy-chain operation called “slate mailers,” also known as “endorsement mailers.” The slate mailer operation is a lucrative enterprise where an established politician like Maxine Waters gets paid to endorse a political candidate. The mailers are sent to 200,000 residents in South Central Los Angeles, a district Waters represents. FEC filings show that Maxine Waters’ campaign scored almost $300,000 from these slate-mailer endorsements in 2016, the Free Beacon reported. Karen Waters was paid $70,000 to run her mom’s slate-mailer operation last year. New FEC filings show that Maxine Waters is set to pay her daughter another $108,000 for her services. Once this payment is made, Karen will have hauled in $750,000 for running her mom’s slate-mailer campaign since 2006. Congresswoman Waters has been hypocritically trashing President Trump for being “corrupt” because he has his kids helping him in the White House. Yet, she has been secretly using her political position to help her daughter and husband pocket hundreds of thousands of dollars over the years. Maxine Waters, usually a great source for really bad and seemingly stupid quotes (In February, a blithering Waters claimed Vladimir Putin had invaded Korea and she couldn’t remember what Aleppo was ... it’s the war-torn city in Syria that’s the epicenter of the refugee crisis) has been among the primary combatants of opposition against President Donald J. Trump, and she has vowed to obstruct Trump as much as possible, and has promised to impeach him. Never mind that even lame-brain Nancy Pelosi has enough sense to recognize and concede that the president has committed no impeachable offenses. 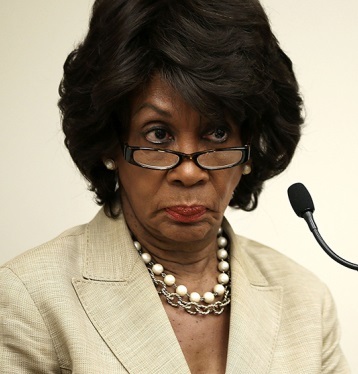 Maxine Waters’ career highlights include being rated one of the “most corrupt” members of Congress in 2005, 2006, and 2008 by the George Soros-funded liberal watchdog CREW (Citizens for Responsibility and Ethics in Washington). One is not sure which is worse. Her corruption, her lack of sense, her hypocrisy, or her devotion to an ideology soaked in communist roots. I suppose I could choose "E", all of the above. The Democrat Party has created a destructive and false narrative, and they are going to stick to it through thick and thin. If accused of creating it through smoke, mirrors, and misdirection, they will deny, deny, deny. The liberal left machine has maligned President Trump in so many ways, and as a result we don't even seem to understand who he is, or what he is, in the first place. They want us to believe he ran for President to seek power, that Trump is a racist and a sexist who fed on the white supremacy feelings of a segment of the population, and that in the long run what he wants is a strong government that controls everyone, and destroys the freedoms we have enjoyed for over two centuries. Interestingly, he was never considered a racist or sexist until he dared to run against the Democrats. Let's take a look at their arguments. 1: Why Run for President? 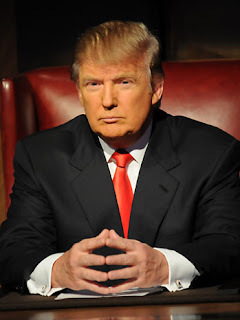 Why did Donald J. Trump run for President? Was it for wealth? For power? He already had those things, so surely neither qualify as a serious reason for Trump running for office. Could it be he genuinely felt that America's light was being extinguished, and that it would take a firm hand like his to "make America great again?" I believe Mr. Trump joined the 2016 Presidential Campaign because he had some issues that were important to him, and the party who was supposed to be strong on those issues, the GOP, wasn't even talking about them. It was as if the Republicans were too afraid to discuss immigration, Islam, or repealing Obamacare. Then, once Trump dove in, with the intent of putting a spotlight on his big issues, his business and economic acumen began to kick in. People responded, so Trump responded. Naturally, Trump is a boisterous son of a gun, and after decades of wimpy Republicans bending over backwards to the demands of the Democrats, even when the party of the donkey was in the minority, Trump's "in their face" attitude and techniques struck a chord with the voters. Finally, someone who would not put up with the establishment, and would actually stand up against it. Donald Trump reminds me of Captain Kirk of the Starship Enterprise. He does not believe in no-win scenarios. He is one to jump it without looking, even if it is the unpopular thing to do, because he thinks his way is the right way to fix whatever the problem is. Sometimes, Trump speaks without checking with the consultants about the dangers of what he's saying, or doesn't realize that what he says or does could be twisted to mean something else. But, in truth, Trump doesn't care; and often, those misspoken tidbits are not what they seem. Often, they are well-placed land mines in Trump's never-ending art of the deal that may be setting up his next move. Take what he says the way you want, he's going to do what he thinks is the best way to defeat the undefeatable, despite any political opinions by the same old consultants who've been screwing up the Republican Party since Reagan, anyway. 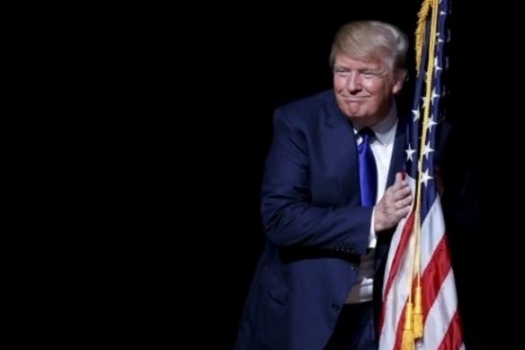 Fact is, Trump likes to win, and he's a competitor, and he will not give up on his pledge to make America Great Again - no matter how convinced some are that his efforts are efforts in futility. Trump informs himself in a variety of ways, and most of them do not include the mainstream media. This ticks off the leftist journalists who think that their job is to set the narrative. So, they accuse Trump of chasing "fake news," and of accessing news that is not authentic or trustworthy. Problem is, after everything pans out, it turns out Trump knew what he was talking about, in the first place. Sweden's problem with Islam is a great example of that. The mainstream media also accuses Trump of disseminating misinformation, and they use the size of his inauguration crowds as an example. Trump claimed his inauguration crowd was huge, and the press said otherwise. Then, they provided an image to prove it, except, it turned out the image of the crowd was taken early in the day, prior to the moment the crowd reached its maximum number of attendees. In short, the press believed their own bullcrap, and then hammered Trump for not agreeing with them. In their eyes, either you agree with them one hundred percent, or you are misinformed. There is an old saying about if you repeat a lie often enough, it eventually becomes the truth. The mainstream media uses that technique as much as they can. Past tyrannies did, as well. If telling a lie often enough turns it into the truth, can the lies not be combated by repeating the truth often enough that the truth becomes the new truth over the lies? The Trump administration is very good about the power of repetition, and chipping away at the false narrative promoted by the Democrat Party and the liberal left media. Sean Spicer, in his press conferences, slams the media, exposing them for their religious adherence to their false narrative. And then, Spicer, like Trump, repeats it again and again and again. The Democrats have a history of using various strategies exposing certain pieces of news in order to distract you from what they are doing. It's like the magician who uses misdirection to get you to watch one hand, while the other does the dirty work so as to make the illusion he is performing convincing. The Trump team has realized that the Democrats do this, and have created their own power of distraction. However, instead of creating scandals to cover up illegal doings like the Democrats do, the Trump distractions are designed to get you to stop talking about the crap the media is putting out there. 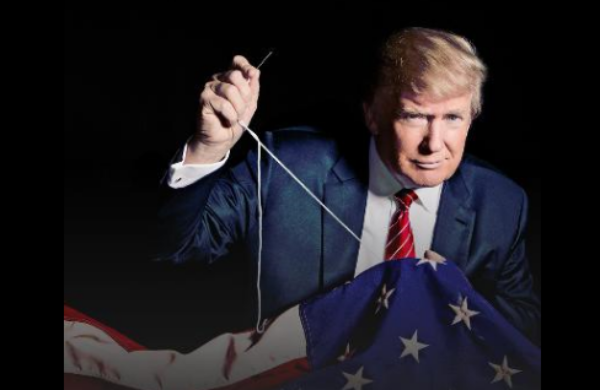 As the media accuses Trump of something, rather than bicker with them like he did until recently, he simply performs an action that takes your mind off the media's lies and onto what Trump is trying to do as President. Usually, it works. As the scramble with Congress to get them to work with him on Obamacare and tax reform is going on, a couple important military actions were pulled off. Suddenly, everyone was talking about Syria's airbase, or the "Mother of All Bombs" being dropped on ISIS in Afghanistan near the Pakistan border. They were positive distractions to remind you this President isn't just what the liberal left media says he is. Like him, or not, Trump is consistent. He is always the guy we saw campaigning. As the saying goes, it's just "Trump being Trump." He's not a political figure, he's a businessman. While everyone touted how "presidential" his speech to the joint session of Congress was, that was simply Trump relying on his speech writers, and realizing that sometimes, he has to make the establishment hounds happy. But, what we love about him is that he's not a part of the establishment, and he has consistently reminded us of that with his actions as President, and the people he has surrounded himself with. Trump Tweets. He says seemingly bombastic things. He slams the media and the Democrats. And to the horror of the liberal left, Trump is not going to change those things for anyone. The Democrats have been saying that the status quo has been the problem, that the Washington way to do things was broken, and someone needed to come in and drastically fix it. Then, they offered a status quo candidate in Hillary Clinton, and are surprised people voted for Trump because he came in as an outsider agreeing that the status quo is a problem, and had a plan to upend it, and fix it. And his drive to stir the proverbial establishment pot will not end. He will consistently challenge the ruling elite, and put them in their places. President Trump is not part of the status quo that Americans have now been conditioned to oppose, and he’s not going to change to accommodate the establishment's minions in Washington. The media had it wrong when it came to the polls about Trump approaching the election. They were stunned that their polls were all wrong. Their manipulation of the polls told them Hillary was the christened one, and that Trump had no chance. How could the polls be so wrong? Yet, now the media continues to follow their polls. They are excited because their polls have Trump showing very unpopular numbers. The polls are against Trump and this makes the media very happy. But, if the polls were horribly wrong during the election, what makes the liberal left media think the polls are not horribly wrong now? Those same polls that show Trump with a low approval rating, the worst of any president at this stage, also say that Trump has little chance to make it through his first term and assumes there’s no way for him to avoid a midterm disaster. Is it not odd that the mainstream media is continuing to retain their faith in polls discredited by the election? Could it be that the truth is something different than the polls are saying? Could it be that the bubble the leftists live in is not the mainstream, but is actually way outside the mainstream, and that the media is so disconnected that even when the truth slaps them in the face, they can't recognize it? 8: A Well Oiled Machine. The mainstream media and the Democrats have been trying to put out a narrative that all is not well within the Trump White House. Chaos is knocking on the door. They have no idea what they are doing, and the amateur hour of the new White House will be its undoing. Except, Trump seems to have it all together. He's not showing the signs the leftists claim are there. He's not crazy, he's not mentally unstable, and their attacks have not broken him like they thought they would. Trump is the opposite, in fact, of what he is being accused of. 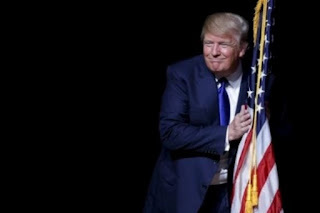 While the media and Democrats are trying to portray Trump as weak, he is showing strength that can be compared to only two twentieth century presidents, Reagan and Coolidge. He doesn't back down, he's been focused on the tasks at hand, and he's been clear about his aims. The Republican Party is still trying to figure out who it wants to be, and it has been the Democrats who have been seeming frighteningly unstable. Nancy Pelosi and Maxine Waters, for example, have had recent meltdowns of epic proportions. The accusations that Trump's administration is not a well oiled machine like Trump claims it to be is based on a lack of speed in accomplishing what he wants to accomplish. And, many times, Trump has said there is no hurry. There shouldn't be. We are a republic, not a democracy, and in republics, things take time. Efficiency and swiftness are attributes of dictatorships. I remember when Pelosi murmured her famous, "I don't understand how McCain got so many votes. I don't know anyone who voted for McCain." The Washington Bubble is a real phenomenon, and shockingly, the politicians don't realize that the world outside their bubble is nothing like the utopia in their little bubble, or inside their demented little minds. When the truth tries to sneak its way in, the media and Democrats will do what they can to protect their bubble's narrative. For them, a view of the world outside their bubble would be devastating. Trump does not reside inside the Washington political bubble, and he never has. He's more in touch with the outside world than the media and the Democrats are. And, when the media and the Democrats try to protect their bubble, the attempt is obvious, and exposes them for who they really are. It's like when they had the narrative about the Tea Party being a bunch of violent racists. They did everything they could to manipulate the coverage of the Tea Party, but the coverage was simply evidence of the bias of the media for those who understood what the Tea Party really is. In short, the media is using a narrative and imagery in an attempt to create their own kind of truth. The media cherry-picks quotes and images to fit their worldview, and then other journalists and social media warriors blow them out of proportion, and explode them into a cartoonish caricature that exposes the liberal media for exactly who they are - peddlers of fake news (as they try to accuse their opposition of being proponents of fake news). 10. Who the Trump Voters Truly Are. The liberal left progressive Democrats still believe that they lost the 2016 Election because Hillary was a bad candidate, or because the Russians interfered, and the reality is, neither are the reason for Donald Trump's White House win. The truth is, the voters who put Trump into office are average Americans fed up with the establishment, and happy to see someone willing to stir the political pot. Some of Trump's voters didn't even necessarily agree with his politics, but they were excited to vote for an outsider who is willing to overturn the apple cart. Average Americans were absolutely jazzed to vote for the outsider billionaire with no government experience. They liked his temperament, and rejected the media's false narrative about Trump's character. They don't trust the liberal media, they are sick of the establishment, and they knew that Trump was the only Republican with enough brass in his undershorts to stand up to the "bureaucracy as usual" crowd. The media also does not understand that the rest of America is not California, New York City, or Washington D.C. The political ruling elite, and their media minions, do not understand the impact that illegal immigration is having on our daily lives, the devastation to our wallets the leftist economic policies are having, the frustration of watching manufacturing die in America as we are inundated with Chinese imports, and the fear we have of Islam and the fact that our leaders have refused to take the fight to the terrorists without creating a drawn-out boots on the ground kind of campaign. Simply put, we are tired of wimps and liberals giving away America and working to extinguish our shining light on the hill. We wanted real change, and we wanted our change to be equipped with a brass pair. With Trump, we got both. 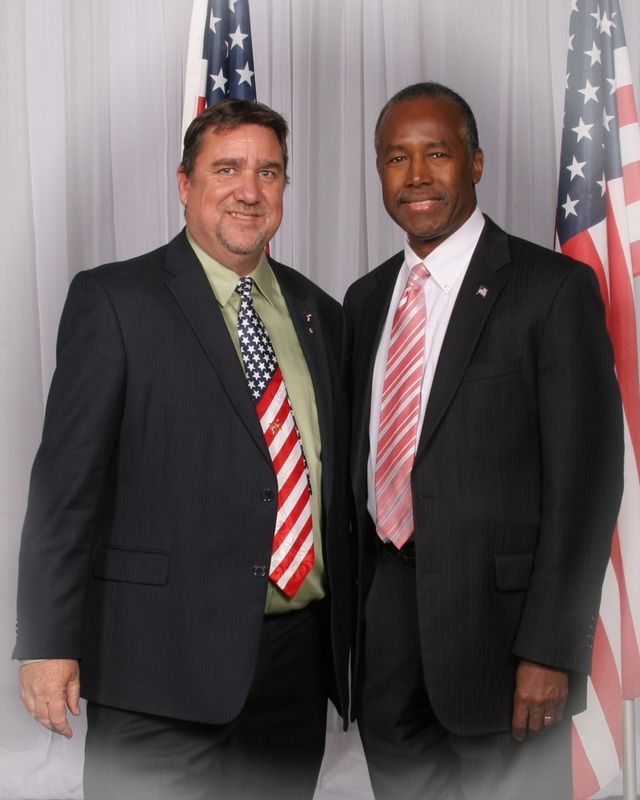 Now, we simply hope he abides by the limitations on the federal government imposed by the U.S. Constitution. North Korea test-fired a ballistic missile on Saturday (local time), Korean news service Yonhap reported citing South Korea's military. 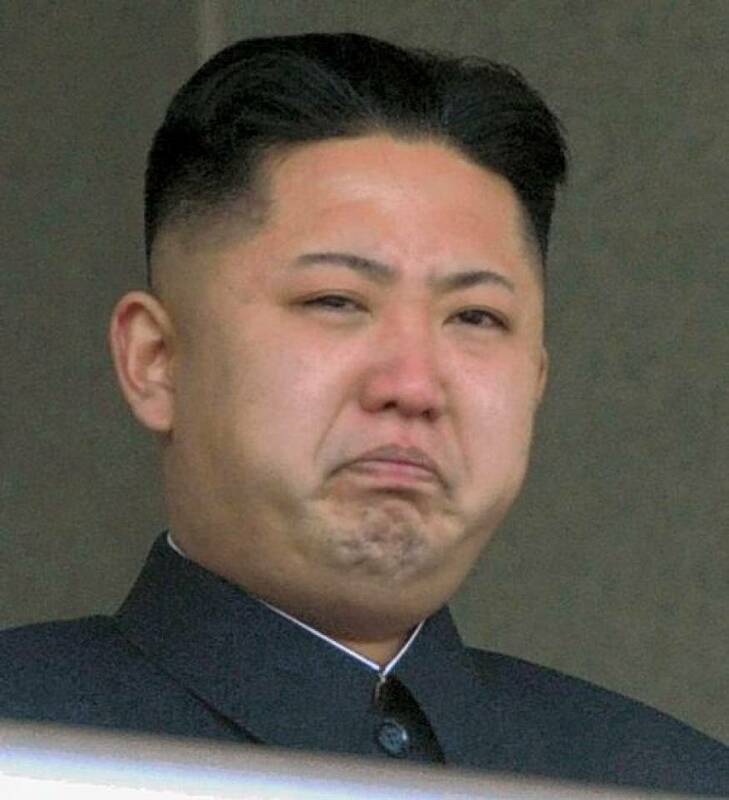 Yonhap reported that the test appears to have failed. The more the pudgy dictator fails to get a missile in the air, the less concerned we are that war is inevitable. I am suspecting he is on the verge of dropping to his knees and pounding his pudgy little fists into the ground in a royal, godly, "our leader" fit of a temper tantrum. Delegates representing the States wrote the U.S. Constitution to create a federal government to serve the States, and handle external issues such as war and trade with other countries; not to rule over the States and interfere with internal issues regarding the life, liberty and properties of the people, or to disrupt the internal order, improvement, and prosperity of the State (Federalist 45 by James Madison). As the authors of the U.S. Constitution, the States are the parents over the federal government, and the final arbiters of what is constitutional, or not constitutional. If a U.S. law is deemed unconstitutional by a State, as per Thomas Jefferson in his draft of the Kentucky Resolutions, 1798, the State may nullify that law. "Where powers are assumed which have not been delegated, a nullification of the act is the rightful remedy." In Article VI., while there may be arguments by progressives claiming State nullification of federal law is unconstitutional because of the Supremacy Clause, the reality is that the clause DOES NOT SAY "all" federal laws take precedence over "all" State laws. It states that U.S. laws made "in pursuance" of the Constitution are the supreme law of the land, and State laws cannot be to the contrary of those U.S. laws made "in pursuance" of the U.S. Constitution. Texas has decided enough is enough. They are ready to being nullifying unconstitutional federal laws, regardless of the Fed's opinion to the contrary, and regardless of what the courts have to say about it. The Republicans of the GOP majority Texas legislature have proposed the "Texas Sovereignty Act," which calls for nullification of unconstitutional federal laws. "If Texas has to live under California's environmental regulations because the court says, 'Oh no, Texas can't be Texas, Texas has to be identical to California,' this would make a legislative process to address that," said Cecil Bell, the Republican author of the proposed act..
Bell says he wants to prohibit future overreach from the federal government. Arizona already has approved a similar policy, and other States want to follow suit. Constitutionally, it is their right to do so. Among the targets of nullification is the federal requirement through court decisions regarding the "legalization of gay marriage." Constitutionally, the courts have no legislative authorities in the first place, so their rulings cannot legally make anything "legal" or "illegal." To legalize something is a legislative power, which is a power only afforded to the legislative branch of government. Besides, there is nothing in the U.S. Constitution that authorizes the federal government to be involved in the issue of marriage, anyway. As for the 14th Amendment argument, if read carefully, the clauses usually referenced in the 14th Amendment regarding marriage laws were designed to protect the newly emancipated slaves from being treated differently under the law, and to ensure they were given due process as would be provided for any other resident of any State. The Equal Protection Clause and Due Process Clause was never designed to incorporate the Bill of Rates to the States, or to force the States to behave in a certain manner regarding any issues outside of their treatment of the newly emancipated slaves. 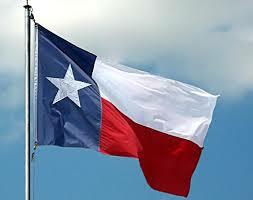 Democrat Chris Turner in Texas says The Texas Sovereignty Act should be dead on arrival. "It proposes a structure for state nullification of federal laws which is clearly unconstitutional," said Turner. However, Turner has no idea about what he is talking about. There is nothing in the Constitution that prohibits States from nullifying any federal law, and if one was to read the 10th Amendment, when it comes to authorities, it is clear that federal authorities require enumeration, but State authorities simply are those things not granted to the federal government, nor prohibited to the States by the Constitution. Or, as James Madison put it in Federalist 45, "The powers delegated by the proposed Constitution to the federal government are few and defined. Those which are to remain in the State governments are numerous and indefinite." Another issue targeted will likely be voter ID laws, which the federal courts state are illegal based on the Voting Rights Act, an unconstitutional law that disallows States from changing their manners and procedures regarding elections without congressional approval, and targets southern States in a manner that exhibits preferential treatment to the other States - a practice that flies in the face of the Framer's desire to seek uniformity when it came to constitutional federal laws regarding the States (mostly found in Article I, Section 8 of the U.S. Constitution). The U.S. Supreme Court has also voided nearly all of Texas' tough 2013 abortion law, again an issue that is none of the federal government's business, and I would like to see the States go so far as to nullify the unconstitutional 1973 Roe v. Wade ruling. The Arizona law passed in 2014 that would allow the State to withdraw its resources from enforcing federal laws it deems unconstitutional, though it has been little used since then and hasn't prompted major legal challenges, has company in a number of States, other than Texas' proposal. Oklahoma, Maine, and Idaho have proposed similar legislation this year. In the Fox News article about the Texan desire to nullify, a constitutional law professor is quoted, and uses case law, not the original intent of the original language of the U.S. Constitution, to defend the liberal left's position. Sandy Levinson, a University of Texas professor specializing in constitutional law, said that while states have the right to refuse to cooperate with the federal government by reserving resources, the only way they can contest the constitutionality of a federal law is to sue. Texas sued the Obama administration nearly 50 times but has been less-litigious so far under Trump. "What would be special is if the Texas Legislature really and truly believes that Texas can decide on their own, 'this is unconstitutional we're not going to do it,'" Levinson said. "That's just bonkers." The argument by Levinson is based on the idea that the federal courts possess a power known as judicial review. The authority regarding judicial review is not enumerated as an express power anywhere in the Constitution's original seven articles, nor in any amendment. The granting of that power, which is even admitted by the most ardent leftist supporters of the concept, is Chief Justice John Marshall's opinion in the 1803 Marbury v. Madison case. In other words, the courts granted that authority to themselves, a tyrannical act of seizing a power that was not supported by the strict constructionists of the time period (like Jefferson and Madison), and should not be supported in today's political discourse. Nonetheless, the progressive left continues to claim that the opinions of unelected judges with no term limits are the definitions we must follow regarding the U.S. Constitution, rather than the original intent of the original language contained within the social contract* we know as the U.S. Constitution written and signed in 1787. The reality is, the States were the contract-makers, and it is the States who hold the authority to review federal law and determine if those laws are constitutional, or not; not the federal court system. Think about it. The concept of judicial review holds that in our system of limited government, the federal courts are the definers of federal authority. In other words, through the courts, it is believed, the federal government may decide for itself what it's own authorities are. How is that limited government? How is that a government that serves the States? How is that a government for the people, of the people, and by the people? * Social Contract: While supporters of the case law approach to the U.S. Constitution claim that the document is a living a breathing document subject to "interpretation" by legal scholars, politicians, and judges, the reality is that such bending and twisting of the U.S. Constitution was never intended. Madison, using the same language used by English Scholar John Locke, called the U.S. Constitution a "social contract." Because our written constitution is a "social contract," that means it is not subject to case law, or "interpretation." In "contract law," when it comes to contracts, the law is clear: either an authority is listed in the contract, or it is not. The idea of "implied powers" or "implied law," if the Constitution is indeed a "social contract," are both unconstitutional, and potentially despotic. Penalty for Climate Change Skepticism? Religious extremists can be violent, be they Islamic extremists, progressive extremists, or environmental extremists. For extremists, the consequences for dissent is death. At the University of Alabama-Huntsville, it seems that climatologist John Christy is an enemy of the liberal left progressive climate change hoax purveyors of tyranny. His penalty for being skeptical of the climate change hoax was to be death, but the shooter missed. Shots were fired at the fourth floor of the science and technology center at the University of Alabama-Huntsville hitting windows adjacent to climatologist John Christy’s office. Three bullets hit windows, while four hit the side of the National Space Science and Technology Center. An incident report was filed after building staff discovered shards of glass Monday morning. Christy is a well-respected climatologist who’s spent decades using satellites to measure global temperatures. He is considered a skeptic of man-made global warming, and environmentalists and left-leaning scientists have attacked him for challenging the credibility of climate models. Christy’s research has shown climate models massively over-predicted global warming, and he’s also done extensive research into flaws with surface-based temperature readings from weather stations. While police say the shooting looks to be random, Christy’s colleague, Dr. Roy Spencer, said it’s “more than coincidence” that shots were fired around Earth Day. “Given that this was Earth Day weekend, with a March for Science passing right past our building on Saturday afternoon, I think this is more than coincidence,” wrote Spencer. “Our street is fairly quiet, so I doubt the shots were fired during Saturday’s march here. It was probably late night Saturday or Sunday for the shooter to have a chance of being unnoticed,” Spencer noted. When word reached the West that Islamists had issued a fatwa to destroy the Great Pyramids, we were appalled. They said it was because the pharaohs represented something that offended Islam, something that is contrary to their beliefs, but we argued in favor of protecting the historical artifacts, citing the historical significance of the pyramids. Besides, those who forget the past are doomed to repeat it. In America, the snowflake liberal left easily offended generation is as nuts as the Islamists. 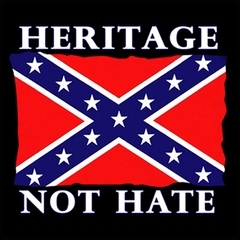 While I am not in favor of racism, see the history of slavery in the United States as among our great sins, and recognize that slavery and the confederacy were tools of the Democrats, not the GOP, I also recognize the importance of preserving the history of the South's heritage. As I said already, "Those who forget the past are doomed to repeat it." In New Orleans, as we've been seeing throughout the South, local authorities are purging its public space of Civil War-era memorials that some say are historically significant and others dismiss as offensive relics of white supremacy. After drilling into the top of the Battle of Liberty Place obelisk — a marble monument that celebrates the 1874 uprising of a white supremacist militia against Louisiana’s Reconstruction state government — workers in bulletproof vests and masks slowly took the structure apart. The city also plans to remove statues of three Confederate leaders — Robert E. Lee, Jefferson Davis and P.G.T. Beauregard — after months of vigorous protest from historical preservation and Confederate groups who say the city is sanitizing its history. “The removal of these statues sends a clear and unequivocal message to the people of New Orleans and the nation: New Orleans celebrates our diversity, inclusion and tolerance,” Mayor Mitch Landrieu said in a statement, adding that city officials would seek to place the monuments in a museum. The Stone Mountain Confederate memorial in Georgia, a vast carving of Jefferson Davis, Robert E. Lee and Thomas J. "Stonewall" Jackson on horseback, is the largest and most epic memorial to the Confederacy. The entire carved surface is larger than a football field. I visited the site in 2002. It's pretty impressive. While the park's memorial status is protected by Georgia law, the carving came under attack in 2015 when a Georgia NAACP leader called for the sculpture to be sandblasted, and the Atlanta City Council passed a resolution asking Gov. Nathan Deal to appoint a study group to consider adding other significant figures, such as the Rev. Martin Luther King Jr. and former President Carter. The South is full of hundreds of confederacy reminders, a sign of heritage, not hate, argue some. The statue of Nathan Bedford Forrest, a Confederate lieutenant general and reported early leader of the Ku Klux Klan, in Tennessee has been vandalized, with "Black Lives Matter" scrawled over the marble in red spray paint. In 2015, the Memphis City Council voted to remove the statue, along with the remains of Forrest and his wife. Yet the city has been thwarted by a Tennessee law that prevents cities or counties from relocating or otherwise disturbing war memorials on public properties. Last October, the Tennessee Historical Commission denied the City Council's application for a waiver that would let it relocate the monument. Looking back throughout history, we notice that free societies do not destroy the past, they seek to learn from it. Tyrannies destroy the past, and knowledge, claiming that it is offensive, when it reality they are working to hide the things that may reveal to the public who they really are. What's next? Are they going to decide that our Founding Fathers were not acceptable, either, and demand that the Washington or Jefferson memorials should be torn down? Then, will the war on free speech depart from the universities and become law? Will being a constitutionalist become a federal offense? A suspected jihadist armed with several knives was thought to be heading towards Downing Street when he was dramatically arrested by armed police, security sources have revealed. The 27-year-old man was carrying a rucksack containing at least three knives when he was detained "following a stop and search as part of an ongoing operation", police said. In Article I, Section 8 of the United States Constitution the text states that Congress has the authority to "constitute Tribunals inferior to the supreme Court." In Article III of the U.S. Constitution, when referring to the inferior federal courts, it states that it is Congress who may from "time to time ordain and establish." With the power of creation comes the power to dismantle. The 9th Circuit of Appeals has been neglecting the rule of law. What they do when they neglect to apply the law, and instead apply their opinions to the laws, is push the rule of man, rather than the rule of law. The leftist activist judges have been ruling unconstitutionally based on their ideological beliefs, rather than applying the law to the cases they hear. 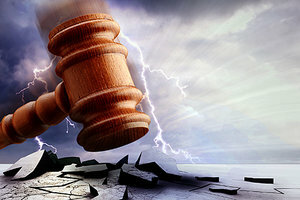 In response to their illegal rulings, of which the courts have no authority to enforce, President Trump said he is considering proposals that would split up the 9th Circuit Court of Appeals. Trump said, "There are many people that want to break up the 9th Circuit. It's outrageous. Everybody immediately runs to the 9th Circuit. And we have a big country. We have lots of other locations. But they immediately run to the 9th Circuit. Because they know that's like, semi-automatic." First came the attacks against his travel ban, despite the fact that Article I, Section 9 gives Congress the authority to prohibit persons from migrating into the United States for any reason, and his executive order referenced those immigration laws he was delegating down to the executive branch agencies, the federal court system claimed he couldn't because, in short, his travel ban was "mean." Now, U.S. District Judge William Orrick has temporarily blocked Trump's efforts to withhold funds from any municipality that refuses to cooperate with immigration enforcement officers. According to Orrick, Trump had overstepped his authority when he directed the Justice Department to put immigration-related conditions on grants for so-called sanctuary cities that may not be directly related to law enforcement. The case, if appealed, would go before the 9th Circuit. Fascinating. I seem to remember the Democrats using the threat of withholding federal funding as a way of extorting the States a number of times in history. About a year ago congressional Democrats threatened North Carolina Governor Pat McCrory of taking away federal funding for the State's education, transportation and health programs because of North Carolina's law refusing to obey Obama's demand regarding "gender neutral" bathrooms in schools. The Obama White House announced that it wouldn't pull federal funding once North Carolina responded that they would take the federal government to court. As for the discretion of funding, and the idea that starving States of federal funding has to be associated with the issue in question, where in the Constitution does it even authorize the federal government to give the States funding in the first place? Interior issues are none of the federal government's business, as is the idea of funding those interior issues. When it comes to the judicial branch's lack of enforcement authorities, Trump can simply ignore the courts. What are they going to do? How would they enforce their rulings? Regarding sanctuary cities, Article VI. of the United States Constitution, in the Supremacy Clause, it states that laws contrary to constitutional U.S. laws are unconstitutional, and the judges "shall be bound thereby." In short, the sanctuary status laws are illegal. The sanctuary cities have no legal leg to stand on, from the point of view of constitutionality. That all said, dismantling the 9th Circuit Court is doable, but not by the executive branch. If the judges need to be removed from their seats, and the court dismantled, the Congress would have to initiate the move with legislation. In Article III's Exceptions Clause, the Congress also has the authority to use legislation to make null and void unconstitutional rulings. One wonders why they haven't used that tool, instead. If one reads the Constitution, and understands the history of the courts, we realize two things. First, the judicial branch was originally supposed to be the weakest branch of the three, not the strongest. Second, among Congress's jobs is to be a check against the courts, the courts are not supposed to be a check against the President or the Congress. The checks against the executive and legislative branches are supposed to be the States, and We the People. In short, all of these rulings by the court against Trump's executive orders are an overstepping of their judicial authorities. The judges are acting illegally. Section 9, Clause 1 that addresses slavery is obsolete. But is the part about migration still in force? One could say that the "migration" portion of the clause is still in force because the 13th Amendment only addresses slavery. The standard belief among historians is that the entire clause is no longer in force. The word "importation" in this clause applies wholly to slaves. According to the clause, however, from the year 1808 Congress would possess the power to stop the importation of slaves, as well as the migration of people the Congress felt must be prohibited from entering this country as immigrants, through the Congress' power of legislation. Article I, Section 9, Clause 2 states that "The Privilege of the Writ of Habeas Corpus shall not be suspended, unless when in Cases of Rebellion or Invasion the public Safety may require it." Habeas corpus is designed to protect citizens against any detention that is forbidden by law. The U.S. Constitution specifically includes the habeas procedure, and instructs the Congress not to suspend such unless the detainment is the result of a "Rebellion or Invasion," adding that "the public Safety may require it." In early New England, in keeping with traditions from the homeland, capitation (caput, meaning head), or poll taxes, were common. These taxes were levied as a way to manipulate the people for the "good of the government." Alexander Hamilton, though condemning capitation taxes in his Federalist Papers writings, was in favor of "head taxes" for emergency revenue reasons. He felt that since sources for revenue were so few, if the government needed to expand for any reason, the ability to lay head taxes, or direct taxation, needed to be an option. However, most of the Founding Fathers disagreed, not only because of their belief that taxation must be indirect and small, but also because of their opinion that the federal government must remain limited to the few authorities granted to it by the U.S. Constitution. Article I, Section 9, Clause 6 states that "No Preference shall be given by any Regulation of Commerce or Revenue to the Ports of one State over those of another: nor shall Vessels bound to, or from, one State, be obliged to enter, clear, or pay Duties in another." Article I, Section 9, Clause 7 reads: "No Money shall be drawn from the Treasury, but in Consequence of Appropriations made by Law; and a regular Statement and Account of the Receipts and Expenditures of all public Money shall be published from time to time." Article I, Section 9, Clause 8 reads: "No Title of Nobility shall be granted by the United States: And no Person holding any Office of Profit or Trust under them, shall, without the Consent of the Congress, accept of any present, Emolument, Office, or Title, of any kind whatever, from any King, Prince, or foreign State." http://www.apfn.org/apfn/13th.htm Thomas J. DiLorenzo, Hamilton's Curse; New York: Three Rivers Press (2008). The articles in the U.S. Constitution all apply to the federal government unless otherwise noted. Article I, Section 10, notes otherwise. Each clause begins with the words "No State shall," making Article I, Section 10 prohibitive to the States. Article I, Section 10, Clause 1 begins by disallowing the States to enter into any treaty, alliance, or Confederation. The goal was to keep the union intact, have all dealings with foreign governments go through the federal government, and to ensure there was no divided loyalties among the States. Treaties and alliances are external issues. The disallowance of the States entering into a confederation was the argument used against the Confederacy during the American Civil War. President Lincoln considered the southern states seceding and joining into a confederation to be unlawful, partly due to this clause in the Constitution. However, by seceding, the States no longer fell under the jurisdiction of the Constitution, making the Confederacy a legal arrangement. No State could grant letters of Marque and Reprisal, or coin money. These authorities were granted to the federal government in Article I, Section 8. States were not allowed to coin money so that they would not use currency as a means to gain an unfair advantage over each other in relation to interstate commerce. Article I, Section 10 prohibits the States from emitting bills of credit. Bills of credit take two forms. Bills of credit are receipts for currency, such as a treasury note, and bills of credit can be items of credit such as bonds. What this means is that the States could not issue paper money, nor could States issue instruments of debt. In other words, the States were not allowed to borrow money. Today, all but two States of the union are in debt. The State deficits are in violation of the U.S. Constitution. The States were also disallowed from passing bills of attainder, ex post facto law, or passing any law that would impair the obligation of contracts. The States, as the federal government, could not issue any title of Nobility. Ex post facto law has become a large concern in recent politics. Ex post facto law is retroactive law. By disallowing the passage of ex post facto law, the States (just like the federal government) cannot constitutionally pass laws retroactively. A gun legal at the time of purchase cannot be made retroactively illegal. Immigrants who entered the State illegally cannot be made retroactively legal. A tax cannot be retroactively imposed, creating a sudden large balance of tax due. States are allowed to tax imports or exports, but only with the consent of Congress. Because States are tasked with having their own inspection laws, any costs necessary for executing those inspection laws may be recouped through imposts or Duties without the consent of Congress. "The net produce of all duties and imposts, laid by any State on imports or exports, shall be for the use of the Treasury of the United States." In other words, the States cannot over tax imports and exports. They are only to charge taxes necessary to cover their costs, such as "executing inspection laws." Any net produce, or what would be considered "profit" in the private sector, goes to the U.S. Treasury. All of the States inspection laws, or other laws regarding imports and exports, are also subject to revision and control by the Congress. Having a military is also forbidden to the States in time of peace, except with the consent of Congress. However, if a State is invaded, or the State feels they are in imminent danger, they are allowed to form a military. Currently, 23 States have State Defense Forces, or "State Militias." In recent years, State Defense Forces have proven vital to homeland security and emergency response efforts. 1. What does the various prohibitions to the States have in common? 2. How do the prohibitions to the States relate to concepts like the Tenth Amendment?